Yankees slugger Joe di Maggio got three hits in four times at bat against the Cleveland Indians on July 16th, 1941, extending his record hitting streak to 56 games. The streak would end the next day in Cleveland. Ohio native Neil Armstrong would become the first man to walk on the moon during the Apollo 11 mission. Armstrong, Michael Collins, and Edwin “Buzz” Aldrin were aboard the Apollo 11 spacecraft when it lifted off in a ball of fire from the Kennedy Space Center on this day in 1969. The comedy “Ball of Fire” earned an Oscar nomination for Barbara Stanwyck, as did “Stella Dallas” and “Double Indemnity.” Stanwyck helped sell a lot of popcorn during a 60-year career in movies and TV. 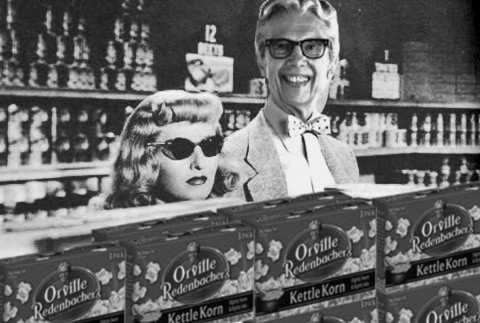 She was born on July 16th, 1907 — the same day and year as another person in the popcorn business, “gourmet popcorn” grower, Orville Redenbacher.